On account of Global Handwashing Day, Bhatia Hospital held a very special activity with children at the Door Step School’s Reay Road branch on Monday. The session was held by Dr Rashi Mehta, Microbiologist, and Sister Kanchan from Bhatia Hospital and saw more than 70 children enthusiastically participating in the event. Each year, October 15th is observed as Global Handwashing Day. This year, the Global Handwashing Day theme focused on the links between handwashing and food – including food hygiene and nutrition. The activity began with Dr Mehta and the Infection Control Staff from Bhatia Hospital explaining to the children why it is so important to maintain hygiene of the hands. Dr Mehta told the children that hands are innocuous carriers of many microorganisms, some of which may lead to spread of disease in us as well as those around us.Common illnesses that spread due to improper or lack of hand hygiene include Common cold (influenza), Chicken pox, Hepatitis A and E, Norovirus and even Typhoid if hands are not washed properly after using the bathroom. 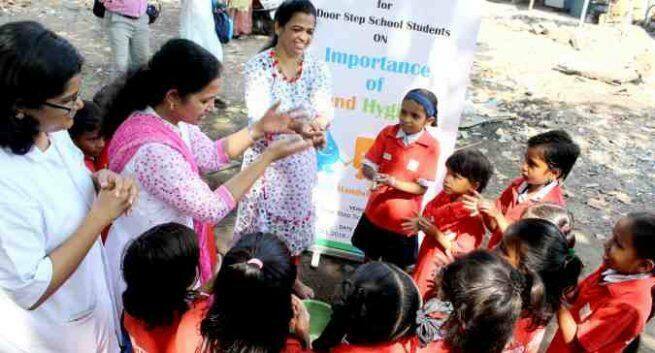 The team from Bhatia Hospital then showed children the exact way to wash their hands to ensure they become clean. They mentioned proper ways like washing hands with soap at critical times, especially before eating, cooking, or feeding others. They were also told other very alarming things that could catch their attention instantly like: ‘You Might Catch More Colds, Faecal Matter Might End Up In Your Food, You Could Get Or Spread Food Poisoning, You’re Infecting Everyone You Touch, Pink Eye Could Rear Its Ugly Head,Your Snacks Will Get Contaminated, You Might Pick Up Hepatitis A, Diarrhoea May Become A Frequent Visitor etc. The entire team and the children then vowed to wash hands frequently and as needed to keep diseases at bay and to lead a healthy life.